Morland Tower. Photograph: Julian Blake. The Town Hall has been called out for “serious failures” in its communication by a residents’ association as it pushes ahead with a £1.7 million programme of repairs to Morland and Fields Tower. Decorative brickwork fell 100 feet from the London Fields block in November 2017 and landed close to the entrance of a primary school as a result of corroded supporting pins. Residents have challenged the extent of the works proposed by the council, which were described by structural engineer Alan Baxter as “seemingly excessive”, with leaseholders facing the prospect of bills of tens of thousands of pounds for the works. 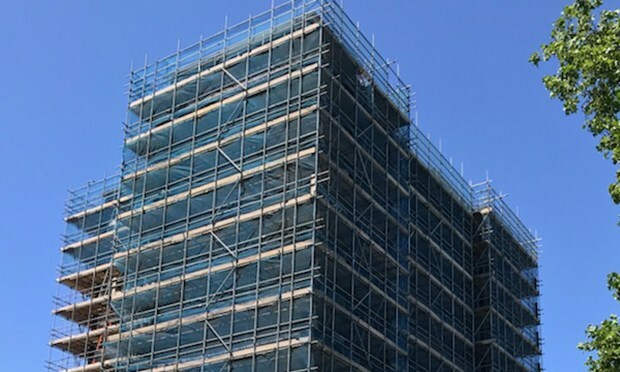 Morland Blanchard tenants and residents’ association (MBTRA) said: “We recognise that urgent work is needed to make the towers safe for residents, and so remove the scaffolding that has shrouded flats around the buildings for the past 14 months as soon as possible. “But we have been concerned throughout at serious failures by the council in communicating the detail of its investigations, particularly during the ‘Section 20’ legal consultation process in October/November. That failure has led to a breakdown in trust between the council and residents. According to the council, the scope and cost of proposed works are all “provisional”. The cost of the works is to be spread over all 46 flats, with the council covering its own tenants’ share, leaving a handful of leaseholders to pick up the rest. The MBTRA also criticised the council for telling leaseholders that any independent assessment of works would have to be paid for themselves, pointing out that leaseholders could not be expected to shoulder the cost of such oversight of the programme of repairs. The Town Hall has stated that they are currently compiling documents with site photographs and notes to help explain the works more clearly to residents. Leaseholders are now “considering next steps”, according to the MBTRA, which states that residents are reserving the right to take the council to tribunal over the matter. An investigation carried out after the bricks fell found that the supporting ties “did not comply with relevant British Standards even at the time the building was constructed”. Works were carried out on the tower as recently as 2010 by arms-length organisation Hackney Homes, which spent £585,095 bringing the building up to the Decent Homes standard, including £27,312.04 for “brickwork, including carefully [raking] out existing brickwork & [making] good all work disturbed and cut loose or defacing bricks and replace with new bricks to match existing”. It is understood from council officers that this earlier work was not focused on the brickwork which collapsed in 2017. A spokesperson for Hackney Council said: “The council is committed to working with the TRA to deliver the work. We have held five formal meetings with TRA and residents, and we have also met with three leaseholders separately. “The council has supplied a package of support documents to the TRA and residents, including relevant surveys, reports and specifications, and has responded to all enquiries and requests for information and reports at every stage. “We welcome the appointment of the TRA’s independent expert and we are happy to work with him. We have asked him to attend a meeting with our appointed engineer, but have yet to hear back. “Works will only be carried out and charged for on areas that need it, and following more intrusive surveys undertaken on an area-by-area basis throughout the tower. “To carry out these surveys beforehand would be very expensive, a proportion of the cost of which would be passed on to leaseholders. “The TRA’s independent expert is invited to attend all the surveys as and when they happen to see first-hand the affected areas. “The brickwork failure that has led to this work was an extremely serious health and safety failure. We must prioritise the safety of residents and the public generally. “Reducing the scope of the remedial work may leave potential defects for the future. However, we do want to ensure that the block is returned safely to residents as soon as we can, including the removal of the scaffolding. “The engineers who we have appointed to sign-off the final works are accredited, independent professionals. “Their reports were further reviewed by a qualified, independent surveyor, acting as principle designer for the council. Works on the towers are due to start next week. EDIT – This article was updated at 15:22 on 24 January to reflect the fact that works, also being undertaken to Fields Tower, are due to begin next week.